Scotland’s peak energy requirement is 10.5GW. The full wind energy capacity of Scotland is 159GW. Perhaps most intriguing of all are these last two points. For the last 300 years, all strategic UK thinking has been, understandably, been done for Britain as a whole. For most of that time, Empire meant that two major axes of thought dominated: across the Channel to Europe and; towards global trade via the Western Approaches. Even though Britain’s role in the world has diminished, these two axes still dominate London’s thinking and consign Scotland to the resulting fate of a province on the periphery. But, apart from political upheavals and an overdue modernisation of Scottish thinking towards near neighbours in Scandinavia and the North, geography is colluding to open up whole new possibilities for that orientation. The steady reduction in summer ice in the Arctic means that, instead of being on the periphery of Europe, Scotland can be re-thought as Europe’s launch pad for the Arctic. 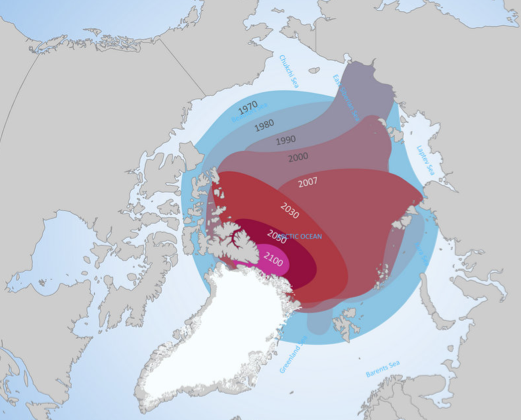 Initially, the season of open water connecting the Barents Sea with the Bering Strait will be too short for commercial exploitation. But demands for raw materials for China and the rest of developing Asia will mean coal, minerals and timber, currently locked in the Russian and Canadian Arctic will drive a commerically viable shipping option. But the secondary effect, more crucial for Scotland is that our rail links to the South mean that we could develop the new Rotterdam—transhipment point where huge, efficient ocean-going carriers have their goods transferred to smaller lighters for local distribution and exports from all over Europe are combined for shipment to Asia. Currently, Rotterdam to Shanghai is 12,000 nautical miles (even using the Suez Canal, which ‘cape size’ ships can’t) and the voyage involves 50 days at sea. A Cape-Size ship would face 13,800 nautical miles and a 59-day voyage. It is not far off that distance and time if a Westward course via the Panama Canal were used instead. But, given the option of the marine equivalent of a polar route, already flown by airlines heading for the Far East, distances suddenly shrink. From the Firth of Clyde’s deep water, massive anchorage and excellent transport links, a Cape-Size ship with an ice-free passage across the Arctic would mean after only 7,200 nm and 32 days it could reach Shanghai, (6,250nm/29 days, Yokohama)—at savings of over 40% in shipping costs. Norwegian and Russian ports may be closer yet but they don’t have our links to the South; US & Canadian East Coast ports would also benefit but would navigate West of Greenland. The resulting passage of the Canadian Arctic archipelago of 37,000 islands would be a nightmare and probably be ice-free for less time each summer. Jimmy Reid’s questing spirit is well remembered in such provocatively forward thinking. Whether or not you want to plunk £40 for this quality book, it underscores that, if Scotland is already capable of making its own way in the world—as balanced, objective financials indicate—how much better would the Scots do if new futures such as this were seized by a people freshly invigorated to plant their country firmly on the 21st century map? This entry was posted in Commerce, Transport and tagged shipping; trade; arctic. Bookmark the permalink.